Flags are rare for a variety of reasons, one of which is the duration that a particular star count was valid. During the late 1880s the United States grew from 38 states to 44 states in less than a year, adding five states: North Dakota (39), South Dakota (40), Montana (41), Washington (42), Idaho (43) and Wyoming (44). In anticipation of the Dakotas entering the Union, flag makers printed relatively large quantities of 39 star flags, but generally did not expect the Dakotas to enter as two states. Before they had an opportunity to react, however, Montana was added just 6 days after the Dakotas, bringing the total count to 41 states. Just three days after Montana, Washington attained statehood and, for a period of 243 days, we maintained 42 states. Thus the star counts of 40 and 41 are particularly rare. Even rarity has degrees, however, and this flag is a fine example of a rarity among rarities. 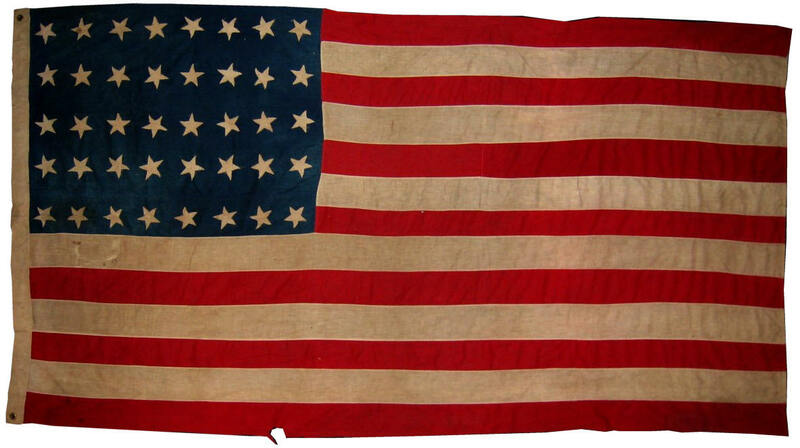 While all forty star flags are rare, there exists two types of printed 40 star flags: one a small type of parade flag printed on cotton muslin, and another a larger press-dyed variation with stars that tilt to the 11 o'clock position. An example of each of these is in the Rare Flags collection (IAS-00089 and IAS-00242). These two versions of printed flags were manufactured, and must have been produced in some quantity. Yet the rarest variations of the 40 star flag are those few that are homemade and of pieced-and-sewn construction, each of which are unique and very rare. This beautiful flag, with its rows of tumbling stars is one of just a handful--perhaps five or fewer--of homemade 40 star flags known. The flag is made entirely of fine cotton and is a beautiful example of the type. Its rich coloration and folky variation, such as the varying widths of the stripes and the whimsical stars that rotate freely within their rows and columns, makes this one of the finest and rarest flags to represent the Dakotas.